For the first time since Barack Obama took office in 2009, deficit reduction has slipped as a policy priority among the public. Overall, 63% say reducing the budget deficit should be a top priority for Congress and the president this year, down from 72% a year ago. Most of the decline has come among Democrats: Only about half of Democrats – 49% – view deficit reduction as a top priority, down 18 points since last January. Deficit reduction had surged as a policy priority during Obama’s first term: Between 2009 and 2013, the share citing the deficit as a top priority rose 19 points. In the current survey, majorities of Republicans (80%) and independents (66%) continue to say reducing the budget deficit should be a top priority for the president and Congress. However, just 49% of Democrats view this as a top priority, the lowest percentage since Obama took office. 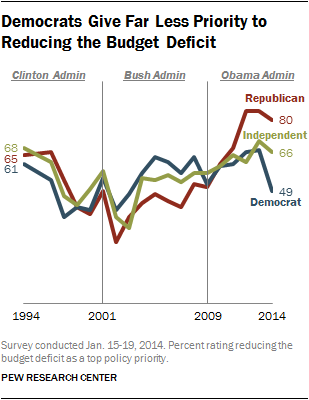 A year ago, 67% of Democrats rated cutting the deficit as a top policy goal. Since 2012, more Republicans than Democrats have rated deficit reduction as a top priority; through much of George W. Bush’s presidency the partisan gap over the deficit was reversed. But going back 20 years, the gap has never been as large as it is today. While the budget deficit has fallen in importance among Democrats, another policy objective – dealing with the problems of the poor and needy – has declined as a top priority among Republicans. 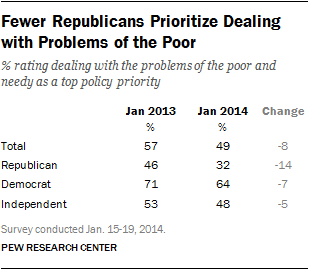 Just 32% of Republicans say dealing with the problems of poor and needy people should be a top priority for Obama and Congress, down 14 points since 2013 (46%). The survey finds that the Democratic Party holds wide leads on several key traits and characteristics – including willingness to work with political leaders from the other party (52% Democrats, 27% Republicans), and concern “with the needs of people like me” (52% Democrats, 32% Republicans). However, the Republican Party holds a 10-point lead over Democrats on dealing with the budget deficit (45% to 35%) and runs even with the Democrats on several other issues, notably the economy (42% Republican Party, 38% Democratic Party). Most Americans do not expect improvement in relations between the parties in the coming year. About six-in-ten (59%) say they think relations between Republicans and Democrats in Washington will stay the same as they are now; 22% expect them to get worse while just 15% say they will get better. Majorities of Republicans (65%), Democrats (56%) and independents (59%) think partisan relations will stay about the same. As Obama prepares for tomorrow’s State of the Union, his job rating on balance is more negative than positive. Currently 43% approve of the way Obama is handling his job as president, while 49% disapprove. While that is little changed since December, a year ago 52% approved of his job performance and 40% disapproved. (For more on Obama’s job rating, see “Obama’s NSA Speech Has Little Impact on Skeptical Public,” Jan. 20). Yet Obama’s personal favorability is positive on balance, with 51% viewing him favorably and 45% expressing an unfavorable opinion. Michelle Obama’s favorability rating continues to be much higher than the president’s: Fully 68% view Michelle Obama favorably, compared with just 24% who view her unfavorably. The survey finds that Mass. Sen. Elizabeth Warren, who has become a leading Democratic figure on such issues as income inequality, is not well known among the public. Overall, more hold a favorable (27%) than unfavorable (17%) view of her, but as many as 56% are unable to offer a rating of Warren. However, among liberal Democrats, favorable opinions of Warren outnumber unfavorable ones by about ten-to-one (54% to 5%). 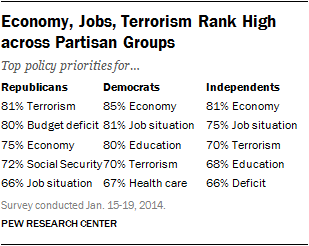 There is some partisan agreement over the leading priorities for the president and Congress. The economy, the job situation and terrorism all rank among the top five policy priorities for Republicans, Democrats and independents. Yet the budget deficit does not rank among the Democrats’ top five priorities, though it is highly rated by Republicans and independents. And while education is rated highly by Democrats and independents, it does not rank among Republicans’ five highest-rated policy priorities. Overall, the widest partisan difference is over the importance of protecting the environment –viewed as a top priority by 65% of Democrats and only 28% of Republicans. The gap is nearly as large on dealing with the problems of the poor and needy (32 points) and reducing the budget deficit (31 points). 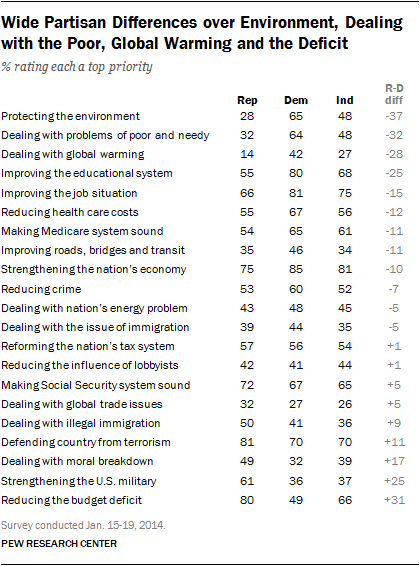 There also are substantial partisan differences over the importance of dealing with global warming (28 points), improving education (25 points) and strengthening the military (also 25 points). There is greater agreement on the importance of some other key issues. For instance, Republicans and Democrats give about equal priority to reforming the nation’s tax system and reducing the influence of lobbyists. And while there is a sharp partisan divide in views of the 2010 health care law, majorities of Democrats (67%), independents (56%) and Republicans (55%) say reducing health care costs should be a top priority. As in the past, the Democratic Party leads the Republicans on a range of traits and abilities. But on specific policy issues, each party holds some advantages. However, about as many say the Republican Party (40%) as the Democratic Party (41%) is better able to manage the federal government. This is little changed from last October; in December 2012, Democrats held a nine-point edge as better able to manage the government (45% to 36%). 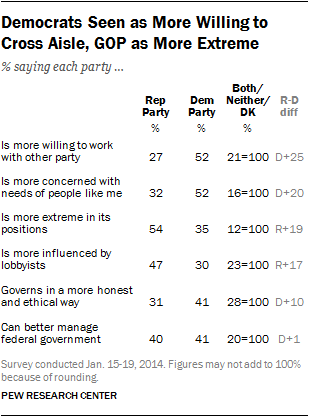 The public is divided over which party could better handle most specific issues. On taxes, Republicans and Democrats are even at 41% each. Roughly equal shares also pick Democrats (39%) and Republicans (38%) as better able to deal with immigration. About four-in-ten (42%) say the Republicans are better able to handle the economy, while about as many (38%) prefer the Democrats. The Republicans’ biggest advantage comes on the issue of the federal budget deficit. 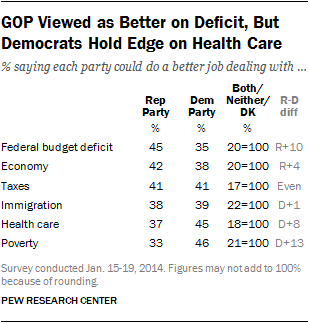 By a margin of 45%-35%, more say the Republican Party could do a better job of dealing with the deficit. Among independents, 44% pick the Republican Party on the issue and just 29% say the Democratic Party would be better. On the issue of health care, Democrats hold an edge: 45% of the public think they could better handle health care, compared with 37% of Republicans. Last September, the two parties were about even on health care (40% Republicans, 39% Democrats), although Democrats have never significantly trailed on this issue in two decades of polling. The Democratic Party also has an advantage in dealing with poverty: 46% say the Democrats could do a better job on the issue, compared with one-in-three (33%) who would choose the Republicans. Barack Obama’s favorability is narrowly positive, while Michelle Obama continues to be viewed very favorably. About half of the public (51%) has a favorable view of the president and 45% view him unfavorably. This is roughly in line with his ratings in the past few years, with the exception of a spike after his reelection and a sharp drop last October (47% favorable, 50% unfavorable then). The president continues to receive high ratings from blacks (90%) and Democrats (84%). But his favorability among Hispanics dropped from 85% last January to 58% in October and stands at 62% today. Among adults ages 18-29, 55% now have favorable views; the president’s favorability had slipped among this group from 74% before his second inauguration to 49% in October. The public consistently rates Michelle Obama more favorably than her husband. About two-thirds (68%) have a favorable opinion of her today and 24% view her unfavorably. Impressions of Michelle Obama remain positive among most groups. Seven-in-ten women (71%) view her favorably, as do the vast majority of blacks (96%) and Democrats (90%). But Republicans are split on their ratings of the first lady: 42% see her favorably and 47% unfavorably. Among conservative Republicans, roughly twice as many view her unfavorably as favorably (56% vs. 29%), but 67% of moderate and liberal Republicans give her positive ratings. While independents are divided in their opinions of Barack Obama (43% favorable, 52% unfavorable), two-thirds of independents (66%) rate Michelle Obama favorably and just 26% have an unfavorable view. 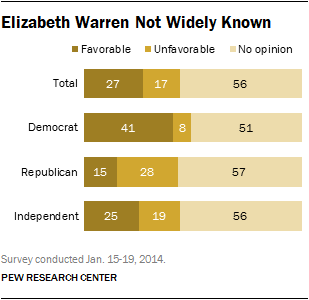 Among those who have an opinion of Sen. Elizabeth Warren, most say they have a favorable impression of her. About one-quarter of the public (27%) rates Warren favorably and 17% feel unfavorably, but a 56% majority does not express an opinion. Warren receives favorable marks from 41% of Democrats while 8% view her unfavorably; about half (51%) do not have an opinion. On balance, Republicans have an unfavorable view of Warren (28% unfavorable vs. 15% favorable), while 57% offered no opinion. Tea Party Republicans are especially negative — 37% rate her unfavorably compared with just 10% who rate her favorably. 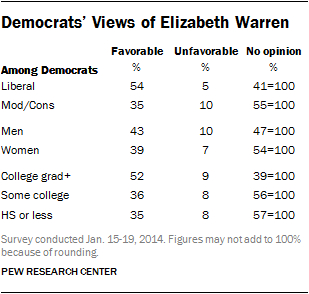 Among Democrats, liberals are especially likely to offer an opinion of Warren and to rate her highly. Fully 54% of liberal Democrats have a favorable opinion of Warren and just 5% have an unfavorable one. Among moderate and conservative Democrats, 35% have a favorable impression and 10% view her unfavorably. Many more liberal Democrats also give her a “very” favorable rating; about three-in-ten liberals (29%) say this, compared with 9% of moderate and conservative Democrats. Democrats with a college degree are more likely to rate Warren positively (52% favorable, 9% unfavorable) than Democrats with less education, who are more likely to not offer an opinion.